It tastes like it was made by angels singing hymns to chocolate in the temple of cheese. It will speed your ascent to the next world, to join the ranks of the chorus. A little slice of heaven brings you little closer to it. 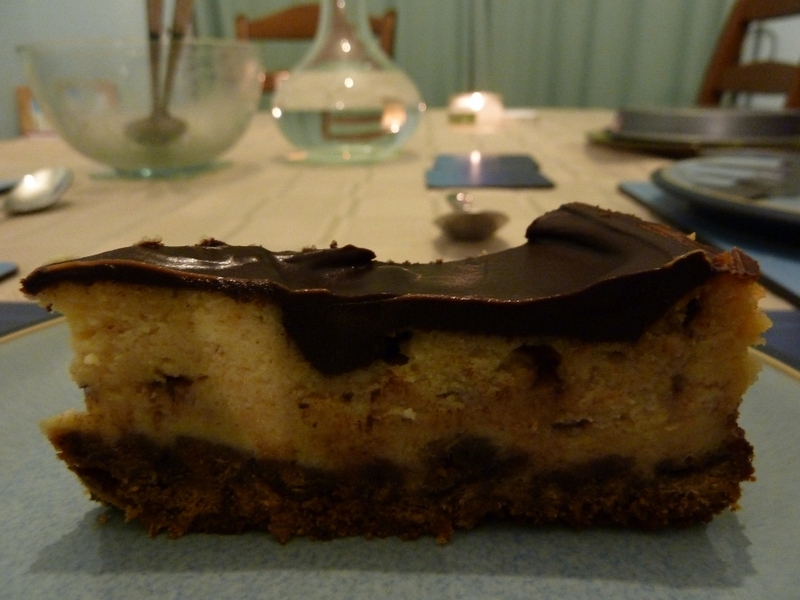 As discussed here, this cheesecake poses that age-old question, “cake and death?” to which there is only one answer: “yes please!”. You will note that the slice above is very, very small, as it leaves you very, very full and very, very happy. Despite this I still had to have another piece… oops. 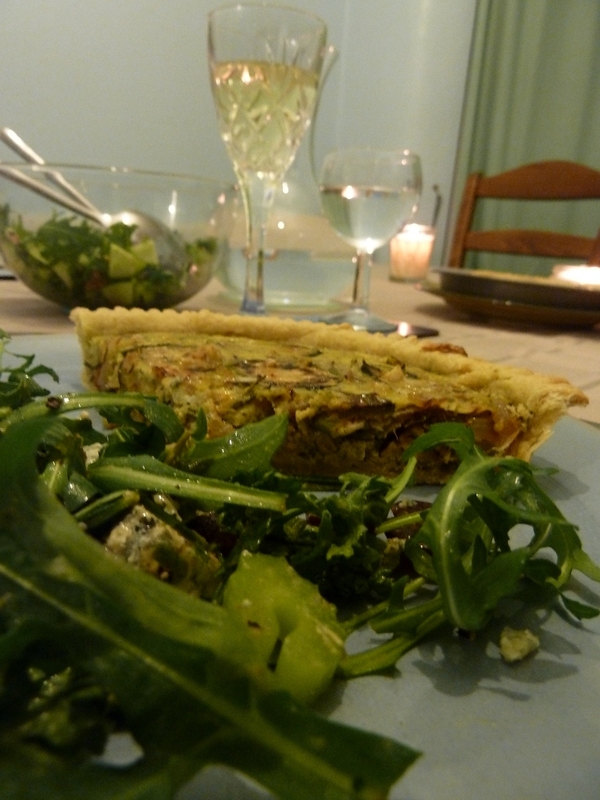 This was our first go at Quiche from scratch, and it was pretty good. We disagreed a little on whether it was awesome or just nice, due to the intensity of herbs used. The main flavour here is rosemary, and you have to like a really intense hit – for me it was just a little too much. We had a salad with it, which was about the best salad I’ve ever had. It was only a rocket, grape and walnut mixture with a dressing, but somehow it worked really well. Rocket powered salad makes a nice launch. The Quiche first. We bothered to make our own pastry, for two reasons: firstly, short crust pastry is the easiest thing in the world, and secondly this was “enriched”, so used half egg and half butter instead of only butter. It gives it a slightly more solid texture and richer flavour. The filling is a courgette, 3 shallots and 2 tbsp mixed nuts (though pine nuts are recommended) all griddled until brown, mixed with 2 small eggs and 75ml double cream and 1 1/2 tsp pesto and 1 tsp chopped rosemary. (Admittedly, we used way more than this…) You just mix the lot together, drop on the pastry, and bake for 30 minutes at 200 degrees celsius. Whoops, we forgot a sprinkling of parmesan… now I’m not going to lie to you, everything does taste better with cheese. But in this case, we didn’t miss it. On to the salad. This was supposed to be a main meal, with roast chicken in, but we just left out the chicken and it worked really well. Rocket, celery, cucumber , spring onion, walnut, Stilton and grapes make up the bulk with the dressing being olive oil, sherry vinegar , mustard and mixed herbs. I think the key is to go lightly with the strongly flavoured ingredients, since everything in here is actually quite interesting to eat in its own way. Who made it: The both of us. Recipe: The salad is “The daily cook book” by love food, september 8th. The Quiche is from “the complete vegetarian cookbook” by Sarah Brown, page 255, with the pastry on page 254. 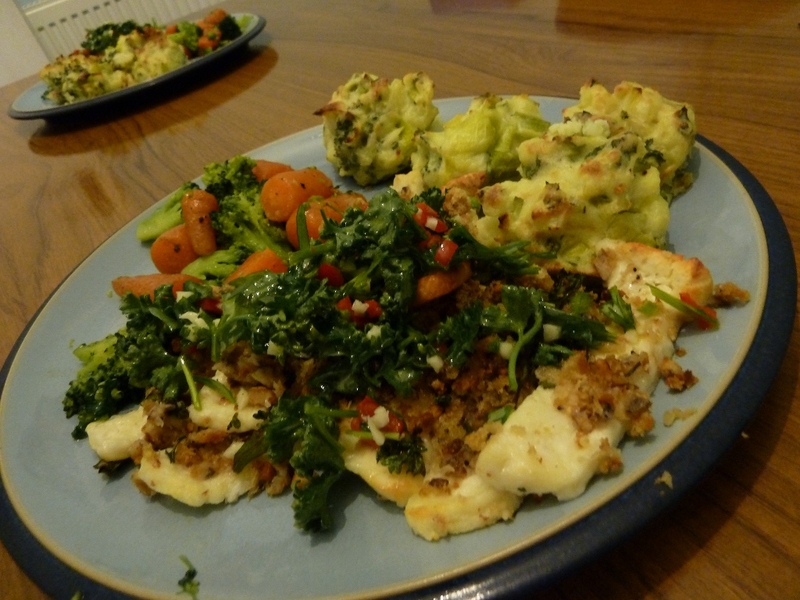 This slightly surprising way of eating cod was well adapted to Halloumi, although Anna assures me the cod was better. Still, it was a very pleasant dinner for not a huge amount of effort. "Italian" Cod with breadcrumbs, with tasty potato cakes. Halloumi baked with breadcrumbs and mixed yumminess. The halloumi replacement works very well, although the flavours don’t compliment the subtle flavourings in the drizzle and breadcrumbs in the way cod probably does. It also sticks if you forget to grease the pan (which is why all the breadcrumbs fell off mine, and then were piled up on top…) What makes it Italian is up for discussion – perhaps the herbs? I’m pretty sure that the Halloumi is not served “Italian style” at any rate! We had these with a favourite way of cooking potatoes – “leek and potato cakes with Gruyère”. To make the breadcrumbs: Melt a knob of butter and then mix well with a crumbled slice of bread, the rind and juice of half a lemon, 15g chopped walnuts, a sprig of rosemary and a tbsp chopped parsley. To bake the cod/halloumi: grease and line a baking tray with tinfoil; cut 75g of halloumi into strips and lay our, or 150g cod fillet (per person). Sprinkle the breadcrumbs over and bake at 200 degrees celcius for 20-25 minutes. To make the dressing: chop 1 tbsp parsley, 1 crushed garlic clove, the remaining lemon juice and rind, 1 sprig rosemary and mix in 2 tbsp oil; sprinkle over the cooked food when serving. Boil 250g peeled potatoes, add milk or butter as needed and mash. Meanwhile, Fry 1 well chopped leek with 2 garlic cloves in butter. Mix the potato and leek mixtures together when both are cooked, and remove from the heat. Mix well with 1 beaten egg, 50g grated Gruyère cheese, 60g creme fraiche, 1 1/2 tbsp parsley and salt and pepper to taste. Place the mixture on a greased tin and bake for 20-25 minutes at 200 degrees celcius until well browned (whether as cakes, or in muffin/yorkshire pudding tins). From experience, it does seem that cheddar isn’t as good for this, although it doesn’t matter hugely. Gruyère seems to make for a more solid cake. Remember to eat some greens! Saute in melted butter if you are feeling naughty*. Who made it: We both did different things as a combined effort. Recipe: Leek and potato cakes with Gruyère: “The complete vegetarian Cookbook” by Sarah Brown, page 177. Italian cod: “The daily cook book” by Love Food, February 20th. * The vegetables, obviously. What were you thinking of? This alternative recipe for truffles doesn’t need condensed milk, which makes it easier to gather ingredients for. In fact you may have them already in the house. The downside is that they lack the richness of their brethren, which we mitigated somewhat by lacing them with amaretto. They do taste pretty great, and once I’d gotten over the fact that they weren’t my favourite truffles I found them pretty tasty (certainly nicer than the M&S ones we had in the house, which are themselves pretty tasty). Obviously the quality of the chocolate is very important. 2 tablespoons liquor (brandy, amaretto, Tia Maria, etc). Our strategy is to melt half of the coating into soft ice cube trays, pop them into the freezer for 10 minutes, mix and melt the truffle mixture, pour in and return to the freezer. Then when it sets, cover with the remaining chocolate and return to the freezer for a final 10 minutes. They look exactly like our previous ones since they were made in the same way. Next time we are going back to condensed milk, which is a little more hassle but oh so worth it. Recipe: “Baking, making and sharing” by Susan Over, page 6. Dare you stare into the face of death? 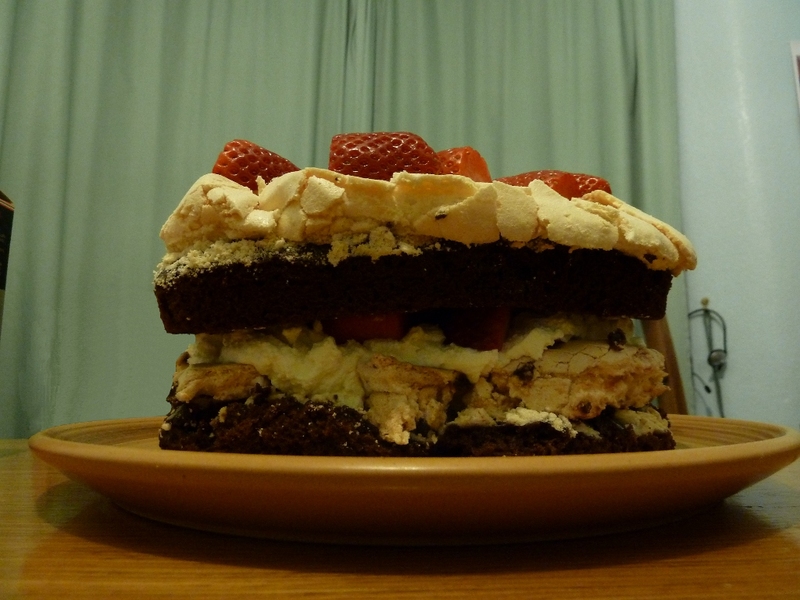 Chocolate cake and meringue and chocolate sauce and strawberries and chocolate cake and meringue and strawberries. This frightening cake stands a good 8 inches tall. In the photo, there is no sense of scale – it looks like it should be on a quite small plate. But that is actually the biggest plate we own. Part bake a chocolate cake. pour a meringue on top. Bake until cooked. Repeat steps one and two. Make a chocolate sauce to go in the middle. Add some strawberries to pretend the whole thing is healthy. It is also very difficult to make it look appealing. The problem is that, fundamentally, meringue is egg and sugar baked until it goes hard. It rises beautifully, creating a huge bubble bursting with sweet goodness. But then you need to get it out, and pile it up in an yummy deathly tower of goo. There really isn’t a way to do that neatly – it breaks up and falls apart. It tastes pretty good – sweetness mixed with bitterness, creating an unusual effect (though the chocolate sauce set again when we kept it in the fridge), and – if size counts for anything! – it looks impressive, in its own way. Anna made this in a heart shaped tin, though sadly (due to subsidence) I couldn’t photograph it adequately from any other angle. Amusingly, the meringue on top cracked… read that how you will! In conclusion: This would be great if it could be better presented, which would help if it was single layered and cooked in a tin with removable sides. Saying that, I think the intensity of the chocolate adds rather than multiplies the delicacy of the meringue – it is as tasty as a standard gateau. Not better, just different. Recipe:”Simply Cadbury’s Chocolate” by Joanna Farrow. 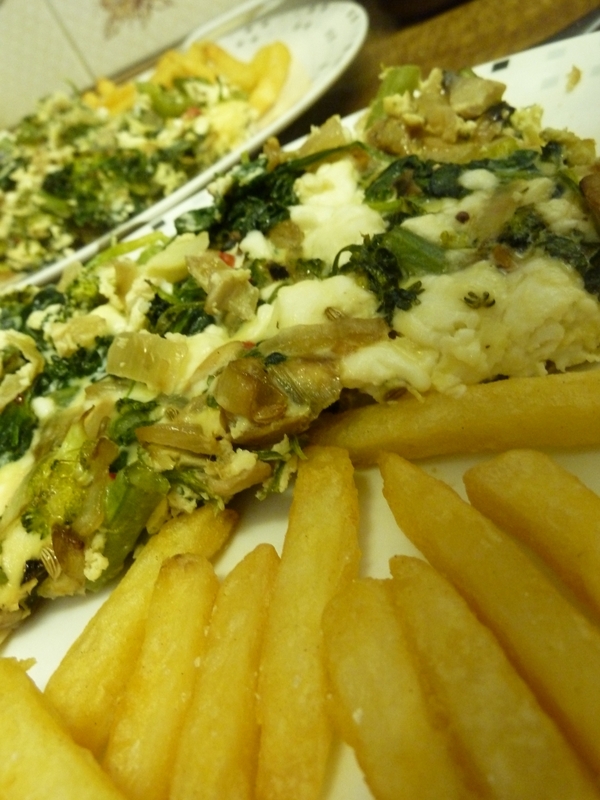 This baked cheese omelette is based on a dish we made a while ago. It is really easy but a very tasty way of making omelette. When they are cooked, add spinach, and your favourite herbs: coriander, parsley, dill, etc. Also add fennel seeds. Bake for 20-25 minutes at 200 degrees. That is it. Obviously any variation is fine. Meaties can add bacon; whatever veg is in the fridge will work well. I think some herbs or spices are important but anything goes – a curry style mix would also do well, with cumin, paprika and coriander. 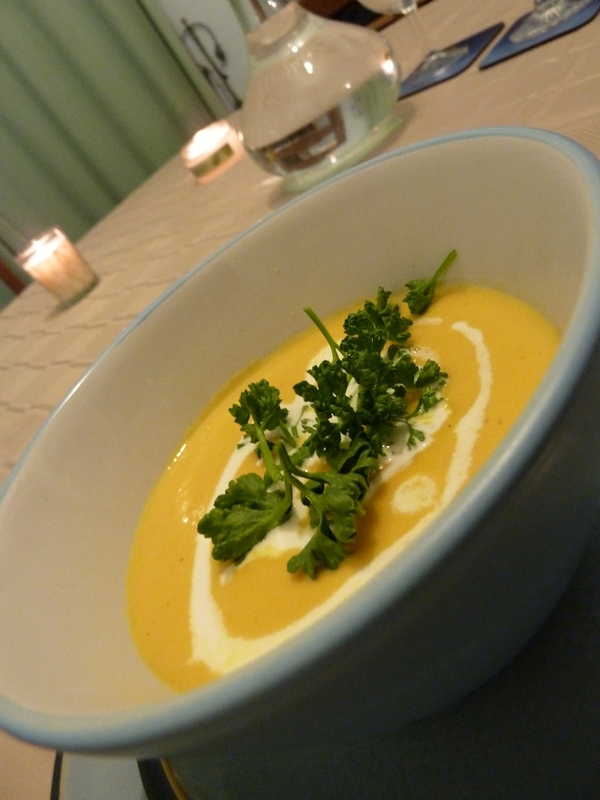 Recipe: Made up, but based on “the complete vegetarian cookbook” by Sarah Brown, page 180. For Cake Club I decided to make Blueberry Muffins. As we have a Vegan in our midsts it is always a good excuse to experiment. I’m pleased I did – the normal muffins were something of a disappointment, but these quite made up for it. Since I kind of made it up, I’ll give a full recipe (sadly no photo though). The basic idea is that instead of eggs, the pectin from fruit can act as a setting agent. Banana is a common option, but I opted for Apple since we had some. Searching around on the internet, I found this recipe that was along the same idea – and didn’t require very many specialist ingredients. I also didn’t have enough Blueberries for both recipes, so split them and made up the difference with cranberries, which worked really well. They come out very moist, rich and delicately fluffy. Clearly, you could replace the soy cream with real cream, and perhaps replacing a little oil with an egg would firm things up for non-vegans. Saying that, there really is no need – these are very tasty. Mix the sugar, flour and baking powder together with the apple. Whilst mixing, slowly add the oil and then the soy milk. Finally add the cranberries and blueberries and mix gently. Pour into muffin cases (it is OK to fill them at least 2/3rds full. They do rise, but will not stay as risen as ordinary muffins – I underfilled them. Bake at 200 degrees celcius for 20-25 minutes or until golden brown. Recipe: Mostly my own, adapted from naturallyvegetarianrecipes.com. Anna wanted to try something a bit different with fish; I was left to do something inventive to make it work for vegetarians. 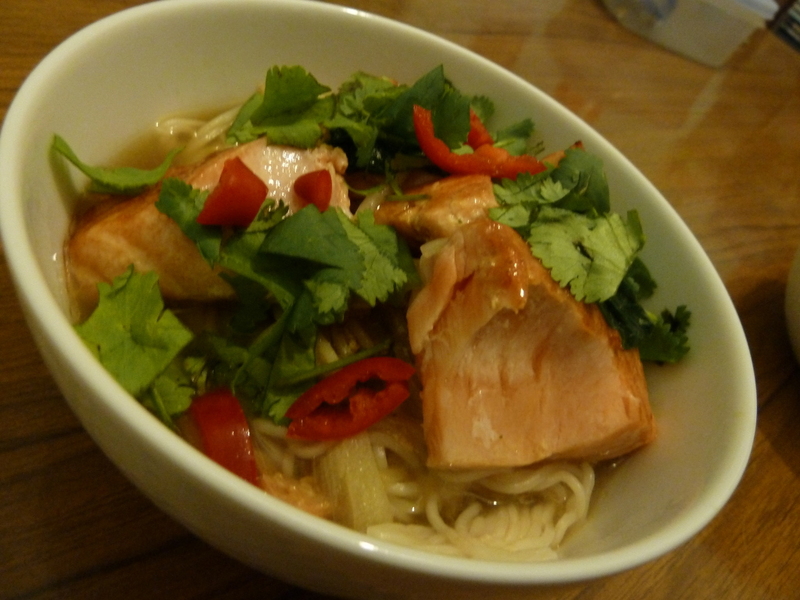 Salmon Ramen = Salmon noodles. With lots of flavour! 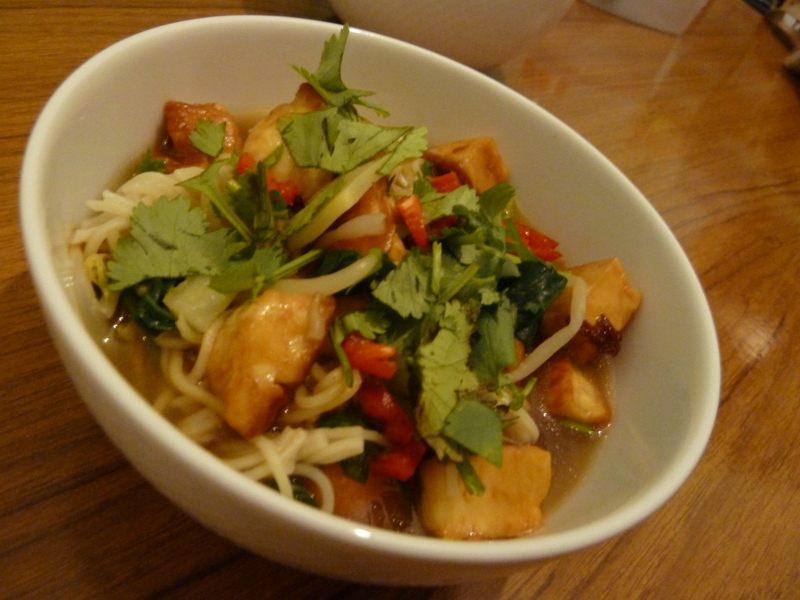 Halloumi Ramen = Haloumi Noodles. Also with lots of flavour! The marinade: Teriyaki. This is an intriguing mix of (1 tbsp) sake, dark soy sauce and sherry, with (1 tsp) brown sugar and some garlic and ginger. The “meat”: either fish or Halloumi, covered in the marinade (“glaze”) and grilled. (I fried the Halloumi, but the effect is basically the same). Stock (vegetable stock mixed with garlic and soy sauce). We also added plenty of vegetables here! Noodles (Ramen if possible, or whatever). Coriander, chopped chillies and beansprouts, for topping. The recipe sounds complicated, but it actually works out very simple and only takes about 25 minutes. You heat the stock and simmer (adding the veg as it needs it, e.g. carrots go in straight away, bamboo shoots and spinach go in at the end). Meanwhile, mix the Teriyaki, and pour over the fish/halloumi on a greased dish. Grill this until the fish crumbles but is pink inside, or until the Halloumi is crispy on top. Then cook the noodles (taking about 3 minutes) and serve by putting a bed of veg with noodles on top, add the fish, then the topping. The dish is slightly hot and just a little different to anything we normally have. 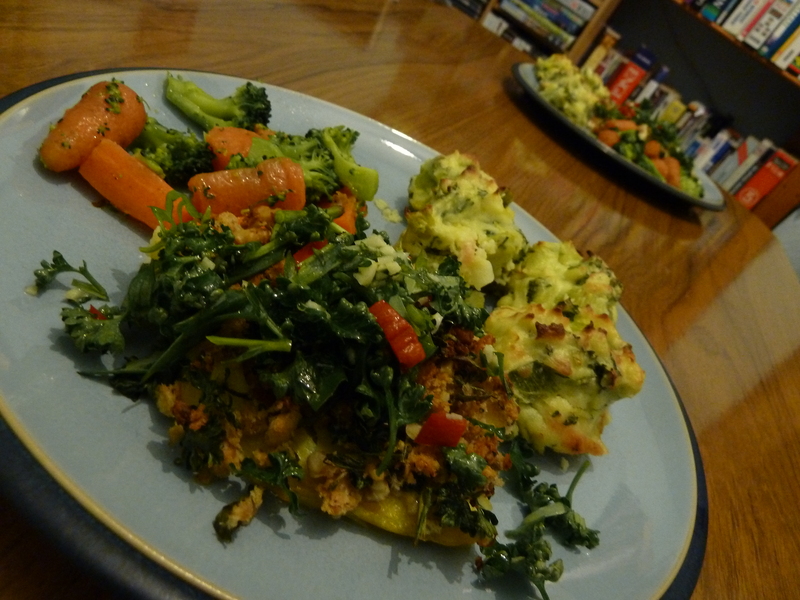 Because we added plenty of veg, it was well balanced – unlike the recipe below, which had a very sad amount in! I particularly like the teriyaki, which would work well in many dishes. Who made it: A joint effort between Dan and Anna. Recipe: “The daily cook book” by Love Food, February 7th. 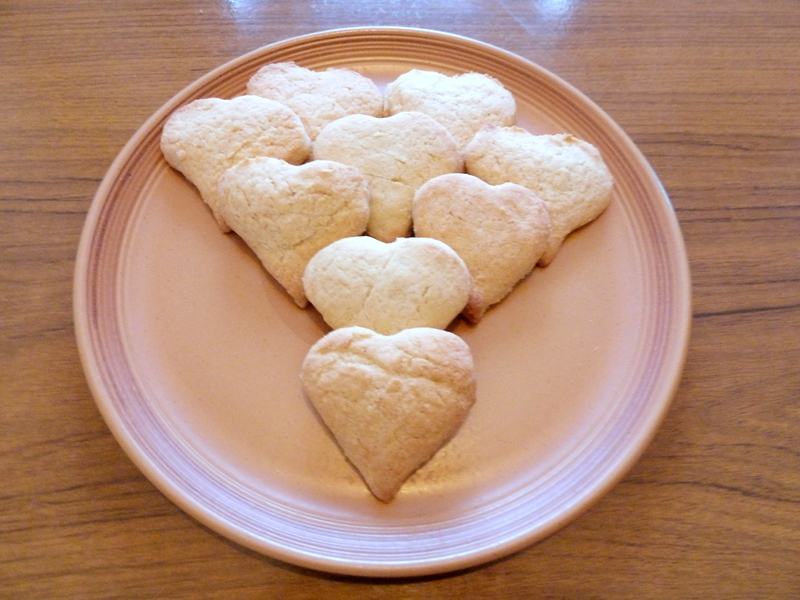 These shortbread biscuits are a simple and yummy treat… particularly for me, when they appeared unexpectedly when I was in the shower! What do you feel in your Heart of hearts? They taste of pure love 🙂 Love of surprise biscuits! Mmmm. We’re still eating them two days later. Taste wise, they are not quite as short as ordinary shortbread, but still resemble them closely. There is only flour, butter and sugar here – with a dash of vanilla essence for flavour. I suspect that they would work well with strawberries – possibly a creamy jam sandwich? Recipe: “The daily cook book” by Love Food, February 14th.